Kim and Walter Eagleton were married in 1985, and had their first “travel adventure” to England and France in 1986. Since that time, they have traveled throughout the States, Europe, the British Isles, New Zealand, the Mediterranean, Scandinavia, the Caribbean, and Mexico. After one “surprise” trip to France (Kim has a history of planning trips with destinations unbeknownst to Walter until they arrive at the airport!) in which they spent a glorious week at the Walnut Grove Cookery enhancing their cooking skills in the beautiful Loire Valley, they have both fallen in love with the countryside and the lifestyle, and now reside in the western Loire Valley of France. Kim and Walter have two wonderful sons. Artistic Gourmet Adventures is the result of many friends and acquaintances expressing a desire to “tag along” on one of their trips. After many cruises, tours, and excursions, Kim and Walter decided they really enjoyed the “small, intimate group” experience, and launched Artistic Gourmet Adventures to provide such an experience to others. By profession, Kim is a Women’s Health Care Nurse Practitioner, but loves the challenge of planning and organizing travel adventures, and caring for people, as well as co-hosting many gourmet-style dinner parties with Walter. Walter is a professional photographer (*PPA Certified, Master Photographer, Photographic Craftsman), a photographic instructor, and has owned a portrait studio in Denton, Texas www.eagletonphotography.com since 1994. In addition, Walter enjoys gourmet cooking and has prepared many multi-course dinners for up to 16 guests in an intimate venue (where he is a “guest chef”) and for charity. As many know, Walter is an avid cook. He would never call himself a ‘chef’, but those who have eaten his creations do. As part of a giving back to the community, Walter and Kim began donating a series of five-six course dinners to be auctioned off at charitable events. One such dinner sold for over $5000 and ‘beat out’ a dinner to be prepared by the namesake of a famous restaurant chain! On all our Adventures, Walter works his magic in the kitchen for our Adventurers using locally grown and available produce. Truly the Taste of the Region! Glenda Lemons has been with us since our first Adventure where she was a guest. We couldn’t keep her out of the kitchen, so she retired early and we hired her! Glenda is also a Women’s Health Care Nurse Practitioner. Kim and Glenda worked happily together prior to the conception of AGA. 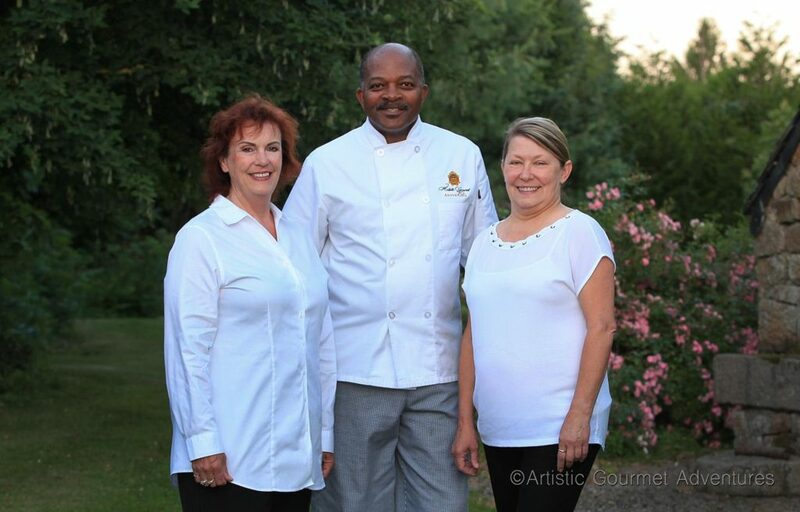 Both Kim, Walter and Glenda enjoy making people happy, be it through the service of food, travel or photography instruction. Every attention to detail is considered to make Artistic Gourmet Adventures an experience of a lifetime.